Could you state and explain your current profile? Do include information on past profiles, if any. I currently work in the capacity of architect and parametric design specialist at Amsterdam based design studio – ZJA Zwarts & Jansma Architects. We specialize in infrastructure projects (bridge design), public transport (stations), stadium designs and leisure. After my master’s graduation, I worked for a while at Rotterdam based design studio – KuiperCompagnons. They specialize more in urban design, spatial planning, landscape, and architecture. What kind of skill-set do you think is necessary for pursuing a career similar to your own? You need to have a creative and methodological approach towards design problem-solving. Draw inspiration and cues from the world around us. 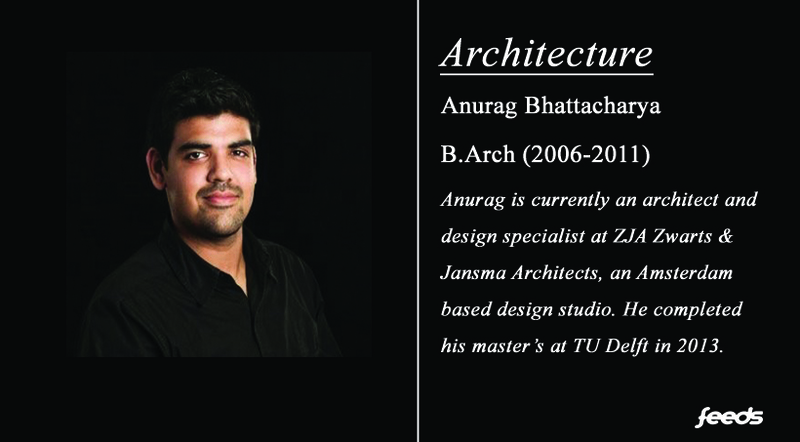 Most importantly be passionate about good design, architecture and curious about advancements in building technology. In practice, you will come across complex assignments and the true craft and challenge lies in the way you abstract them into sub-problems and solve them without compromising the core design concept. Making well-informed design decisions is key. Could you tell us about the projects and internships that you’ve done? At ZJA, some of my recent projects have been patented design of Shaded Dome technology; ongoing design development of Amsterdam Central Station extension project, recently completed HSE in Hague; Thialf ice skating stadium in Heerenveen, interior for skybox at Ajax Arena Amsterdam and couple other bridges, sports and leisure projects. I have worked on Delhi International Airport-Aerocity Concept Design Development with KuiperCompagnons, which is scheduled to complete by end of this year. Do you think pursuing a Master’s Degree is imperative? How does your B.Arch knowledge / experience feed into your current pursuits? The master’s programme, which I pursued at TU Delft, did help me to broaden my horizons in sense of design thought process, challenging the so-called status-quo of design principles and working in a multi-disciplinary environment. We learned to use scripting and design algorithms as tools to explore design variants while negotiating various design constraints, optimization of building geometry and form based on structure, solar and wind forces. In our profession, I think the knowledge or approaches we learn during our bachelor’s or master’s education is just the beginning of a long pursuit towards the refinement of the craft called architecture. It is something which is subjective and varies from individual to individual. Coming back to your question, yes, B.Arch. does feed into my current pursuits even now. What technical knowledge did your college coursework help you with when applying for your Master’s? Architectural design skill, knowledge of building construction technology, basic structural design, 3D modeling skills, presentation, and composition learned during semester design projects and competition entries like NASA, G-Sen trophy, etc. Most universities ask for a design portfolio during admission application and it is indeed one of the most important selection criteria for an architecture student, all the above-mentioned skills need to be consolidated and highlighted in order to showcase your skill set to the university jury. Always remember you are competing with your counterparts from US, Europe, etc., and it’s not gonna be a cakewalk. Technical skills aside, what other skills do you think would benefit someone applying for universities abroad? Keep yourself updated with the current trends in the world of architecture and building technology, traveling and exploring the wonderful vernacular temple and Indian modern contemporary architecture masterpieces, internship during studies is very essential to know what to expect from your career. Constantly ask yourself the question – which direction suits your career-oriented interest the most. Take part in competitions, it is a good approach to test the waters and see where you stand with other international/domestic competitors in terms of quality of design, presentation of your work . Your profile sports the skills – cartooning and blogging. Were you engaged in the aforementioned pursuits in any professional capacity or were they creative outlets? Cartooning and illustrations are still one of my favourite tools to disengage myself from work and professional pursuits. It started as a hobby during early days in school and later on, it turned into blogging where I intended to write about things I found much in life to be funny, strange or downright ridiculous. I used to draw cartoons and illustrations for the TU Delft social media and PR marketing during my master’s study. During my B.Arch., our batch came out with our first weekly poster publication called “Underdog Bites” and was appreciated in terms of graphic design, layout and content quality. Could you tell us about your experiences as a speaker at various lectures and conferences? I have been invited as guest lecturer at TU Delft, Dutch Architecture Association BNA and have published 4 scientific papers and posters in Italy, Norway, and Netherlands. The experience has been great so far. Sometimes when you are in practice, the monotony can hit you at times, and interacting with the fresh and energetic like-minds at universities and conferences is rejuvenating. Besides interaction, personally, it’s a great learning experience for me. Did pursuing multiple disciplines help you varying perspectives in your work? Yes, it does have a great impact on my work. Sometimes when you think from a perspective of a building physicist or acoustic designer or energy consultant you might end up with equally relevant and varied solutions to the same problem. As the saying goes “Jack of all trades, master of none”, is quite valid in our profession, you need not know everything as an expert would know, but you must be adequately aware of various disciplines to make a well-informed decision right from the beginning stages of design development till you go to the definitive design or implementation phase. Is there any information that you wish to be aware of during your time in college? One thing I personally lacked during my college days at Trichy was exposure in terms of the latest advancements in technology, trends, visiting faculties or lectures from practicing architects and design offices. I think in general the Indian architecture school curriculum needs a major revamp in terms of content and relevance in today’s world. Many things we study during our bachelors are totally irrelevant in today’s profession. That time could have been used for something more meaningful, practical and more aligned with practice.